Fry meat and onion in hot oil until light brown. Add potato, carrot and 900 cc of water. Bring to a boil. Cook for about 10 minutes or until the meat and vegetables are tender. Add instant curry, bring to a boil and let it simmer, stirring evenly. Ready to serve. Ingredients: Wheat Flour, Edible Oil (Butter Fat (Milk), Palm Oil), Curry Powder (8%), Salt, Sugar, Flavour Enhancers (E621, E627, E631). 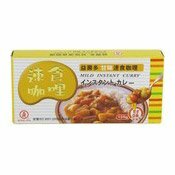 Simply enter your details below and we will send you an e-mail when “Mild Instant Curry (工研甘味速食咖哩)” is back in stock!